Welcome back to the next post in the Fabulous Fiction Fridays series! Last week we saw how so much can be achieved in so few words through the art of Microprose, and we’ll be going down that road again for today’s post. This week’s post features Still Loved, Still Missed and their piece of Microprose ‘The First Window‘. The raw-boned woman gasped for air, smelled death. The dust in the stuffy cell resembled the white fog waiting to knock the wind out of her lungs. The first window let fresh air in. Life made a mass entry. This piece is so on-point in its descriptions, making the contrast between life and death so very clear. The stale surroundings of the cell connote death, the woman even smells it. She’s raw-boned, almost like a skeleton, all skin and bone. The dust is another nice addition to show the passage of time and the dirt present. It takes on a violent form ‘waiting to knock the wind out of her lungs’. The sense of struggling to breath and claustrophobia is perfectly present and written so very well. We, the readers, are able to gather all of this information purely from the descriptions. This is a real talent. The revelation of the window brings relief not only to the main character but also to the reader. The tense atmosphere of the first two sentences is no more and a rush for fresh air takes place. A nice, deep breath of fresh air. It’s like holding your breath underwater and then resurfacing to get some oxygen. This in itself is life. Light and air is life. Banishing the darkness and stale air of the cell, life begins with The First Window. And, if you would like to see more of my work, feel free to check out my latest piece of flash fiction: Mirror, Mirror. I hope to see you again next week for another day of Fabulous Fiction. Welcome to my very first post in the Weekly Wisdom series! What’s it all about? Well, we’re mid-way through the week and just about to go over that hump. Sometimes we all need a little help and wisdom to carry us through to the weekend. Work, chores, family life – we all have responsibilities during the week that sometimes we just need to take a break from. This is our opportunity to do that. Since this is a writing blog, I’ll try to make the quotes relevant and inspirational. 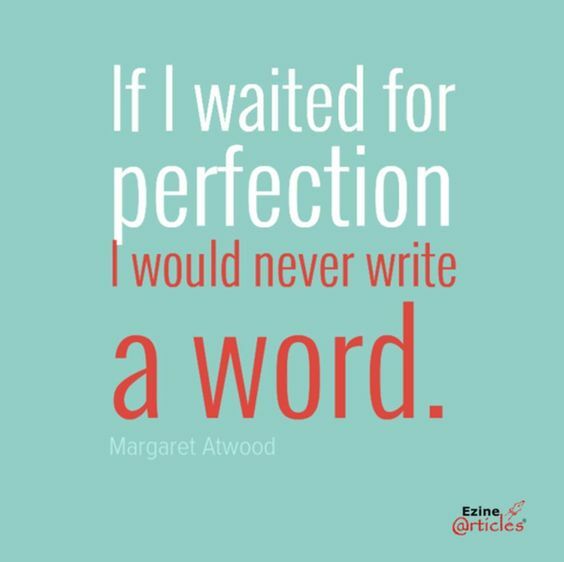 Today’s comes from author, Margaret Atwood. It’s important to remember as writers that there is no such thing as true perfection. We all have our own subjective idea of what perfection is, but there’s no one true definition. It’s so easy to put pressure on ourselves to get perfection, to write the perfect piece. I hate to break it to you, but that’s never gonna happen. The best we can do is write. Writing is better than not writing, right? So next time that you feel that your work is imperfect and you’re close to shutting down that latest project, remember that the word ‘perfect’ itself is a work of fiction. It’s no secret that exercise is the friend of both mind and body. It’s easy to stop taking care of yourself when you have deadlines to meet and precious words to write. This week, I want you to go out and join me for a short mindful walk. You may be thinking: Well, I do this everyday, so what? The difference is, I want you to do this in a way that is mindful. You are not doing this just for your body, but for your mind. Use all of your senses, be there in the moment, put all your thoughts to one side. If you can, find a secluded place where you can connect with nature and get away from the hustle and bustle of everyday life. I’m not advising that you climb a mountain or become an athlete, just ten minutes is enough to reset and relax. It really will help your creativity flow when you next come to write! Personally, I try to do this every day (and mostly fail…) but it’s a great practice to adhere to when you need a moment to yourself. Don’t forget the positive benefits on your body, also! Q: What’s the one thing that you’re going to do for yourself, today? Leave me a comment, and let me know if you do go for that short walk. Kenneth James was an ordinary man with an extraordinary ego. He had achieved many things in his seventy-two years of life. As he stood in the master bedroom of his estate, fire roaring and silk curtains blowing with the assistance of the violent wind, he recalled some of his life’s greatest moments. He began with his takeover as the head of his father’s hedge fund management company after spending so many years as a party boy, finally to be taken seriously. He recalled the many family holidays abroad with his children aboard a private yacht. And how could he forget, three no-expense-spared weddings? It was for his third marriage to Lady Eleanor (a small lady with undistinguished features and the voice of a mouse) that guests gathered outside in his ample garden this evening. It was their 30th wedding anniversary and the social event of the season. Notorious busybody Petunia Porter could be heard admiring Lady Eleanor’s singing begonias from the open window perhaps too enthusiastically whilst her husband started on the buffet. A selection comprising of homemade mini quiche and vol-au-vent’s, he gathered them into his gullet without hesitation. Lord James was not the handsome bachelor he once was to the outside world, but he felt as youthful as ever. He wished more than anything to be the man he once was. After pouring himself a wee dram of whiskey, he sauntered over to the full length mirror in the corner of the room. Bringing up an aging hand up to his face, he examined his furrowed brow and facial wrinkles with his withered fingertips. Reflected in the now glowing mirror was an image of the past, a young Lord James – skin smooth and youthful. Muscular and athletic. “Like what you see?” a deep, sonorous voice rang out across the room. His Lordship could do nothing but admire his new-found youth, nodding his head rapidly, his eyes wide in amazement. “All you have to do is give me your body” the voice boomed once more. Oblivious to the events taking place in the master bedroom, the guests of the garden party began to dance to the tune of a brass band as they drank generous servings of rum punch. Light poured out of the bedroom window, engulfing Lord James in the process. “Yes!” he affirmed “I want to be young again, I want to be beautiful!”. “Your wish is my command!” the mysterious voice echoed out through the estate, instantaneously dragging Lord James towards the mirror. Within seconds His Lordship was no more, his body passing through the mirror, leaving nothing but a pile of tailored clothes and a smashed tumbler of whiskey on the floor before it. The fine crystal glass sat in smithereens on the floor, happily reflecting the light from the fire. Maria Fernanda, the family’s maid for many a year passed the bedroom and spotted the glass on the floor. Tutting, she entered the room and swept up the glass with a dustpan and brush. She folded the clothes on the wooden floor and placed them neatly on the chair next to His Lordship’s bed. “Maria!” a soft voice attempting to assert power beckoned her from outside. She left the room at once and returned to the garden party, serving Lady Eleanor’s guests until well past midnight. Welcome to a brand new feature on my blog! I’m a huge fan of coffee, and will take any opportunity to grab myself a cup. So, with that in mind, every Sunday I plan to recap my week in the writing world and let you know what exciting events (sleeping.. walking.. eating.. sleeping) have been happening in my life! It’s also an opportunity to for me to thank you for reading. So, thank you! And I really do mean that. Well, that’s my first official week as a blogger done. I’m not even sure if I can call myself a blogger yet. I spend far too much time on Pinterest (once you start pinning, you can not stop) and have received a handful of hits every day (something I’m so grateful for, by the way) so does that make me a blogger now? I’ve had so much fun creating some short pieces of fiction (The Gift of Life) including trying my hand at ‘Microprose’ (A Child is Born) for the very first time over at YeahWrite and other writing prompt websites. I find that having a set deadline to achieve something small that you really enjoy doing makes you get into the right gear. It’s so difficult to be productive, and even when you are being productive, are you really doing anything worthwhile? The fact that I can get constructive criticism to improve is just great! I’ve also posted a couple of other flash fiction pieces. Vanity in Peach and A “Happy” New Year? feel free to check them out if you have a couple of minutes to spare today. I feel that the latter post is especially powerful, remembering those who may be suffering in silence when everybody else is too busy celebrating. I also had the honour of launching my Fabulous Fiction Friday series, which I hope will lead me to make contact with many awesome people through mutual support. It kicked off with a piece of microprose by Belinda Bekkers, titled ‘An Introduction‘. Out of the writing world, what have I been up to? Well, welcoming in the New Year of course. I’m confident that 2019 is going to be a great (and hopefully productive) year! I’ve also drank extreme amounts of coffee, walked many miles, tried my hand at photography (again) and tried to keep my brain in check. Self-care is really important to me, something you will be able to follow with my Weekly Wisdom posts (coming soon; next Wednesday!) I promise it won’t be a lecture on how to live your life (is there anything worse?) but just a collection of ideas and practices that I personally find helpful. Well that’s one cappuccino down and as it’s Sunday, the day for relaxing and taking stock, I’m sure there will be many more to follow. Thanks for joining me. I hope you stick around for the next week of my writing journey! Question: What do you do to aid productivity when it comes to writing? A city is silent, waiting for the clock to strike midnight. A moment of reflection for time gone by, remembering achievements and recalling regrets, grieving for those who are no longer with them but holding close those who are. They hold them close, friends taking hands and lovers caressing cheeks. It’s almost time. Hope for the future follows as the countdown begins. 10-9-8-7 Crowds chant in unison, bright eyes fixed on the blank canvas before them. 6-5-4-3 Children jump in excitement at being up past their bedtime, faces tired and glazed. 2 An elderly couple sit at home by the fire and embrace, celebrating another year together. And 1 person sits abandoned in the dark, feeling more alone than any other night of the year. The sky erupts into bursts of colour and blasting bangs, greeted by sounds of amazement by a satisfied audience. As pets in homes succumb to fear, owners turn up their radios in an attempt to sooth them. The lone stranger on the next street questions the value of their life with nobody to turn to. Cold, alone, and hopeless. Whilst some thrive in the color, others are suffering in the darkness. Composed using a writing prompt provided by Flash Fiction for the Purposeful Practitioner. As writers I think it’s so important that we celebrate each other’s work and support one another. For this reason, every Friday I will be sharing a piece of fiction to my blog that I particularly enjoyed from the past week. Welcome to Fabulous Fiction Fridays! This week I tried my hand at Microprose (you can read my effort here) and I was so surprised at some of the other pieces that I came across. It’s amazing how much detail can be put into so few words. This week’s post features Belinda Bekkers and her piece of Microprose ‘An Introduction’. It’s a real skill to be able to convey a story like this in so few words. I feel like I know so much about ‘Tom’ already and how the female character [she/her] feels about him. Manly, smooth, familiar. She clearly finds this combination irresistible after going through her internal checklist. Just a flash of that smile is enough for a sudden rush of adrenaline. It’s interesting how she falls for Tom after such a short amount of time, seeing beyond that initial lust and deciding that it’s futile to even try not to love him. What a hopeless romantic! To give so much depth to a character’s personality traits through actions alone and so little description is really impressive. I think the act of scanning a stranger when we first meet them to gauge how attractive they are is something that we all do, intentionally or not, and this piece captures that perfectly in an instant. The concept here isn’t revolutionary, it’s something that we’ve all experienced but this time it has been taken to a whole new level. A masterclass in taking a simple idea with so few words to work with and making it into something truly beautiful to read! Q: Would you like to see more of these posts, supporting fellow writers? If you would like to see more of my work, feel free to check out my latest piece of flash fiction: Vanity in Peach. And remember, this coming Wednesday will mark the start of my ‘Weekly Wisdom’ series, where I will once again encourage good vibes only. Featuring inspirational quotes and ideas to keep your brain in check, join me on a journey of self-love and mindfulness! My pale skin glimmers in the artificial light of the dressing room, mimicking the ivory tone of my vanity table. “Is this what beauty looks like?” I ask aloud, knowing perfectly well that no answer would be given. I was alone, my bare feet cold against the hardwood floors, but still beautiful. I gaze into my reflection, surely a distant cousin of Aphrodite herself. I pout my lips and ruffle my hair. Alexandria says my looks resemble those of a horse, but she is surely jealous. No horse has ever looked this stunning. And she – well she couldn’t pass for any better than a bloodhound. I smile at my twin, thrilled with my witty thoughts. “Hairspray, a lady’s BFF” speaking aloud once more, I spritz my newly curled locks with abundance. I feel the cool air from the window blow through my garments as I reach for an atomiser, delicately picking a bottle from my collection. A spray here, a spray there. The air now filled with a pleasant blend of bergamot and rose. “Maybe a touch more blush” I think aloud as I search through my makeup bag, an Aladdin’s cave of Dior and Estée. Miss Houndface herself could only dream of such class. I’m lost in my own beauty as I pat my cheeks with the lightness of a feather. A familiar hum awakens me from my trance. My rose-gold iPhone rings happily, the appearance of Alexandria’s name dimming my sparkle. I hesitate for a moment. Compose myself. Flick my finger over the green icon. “Alex, darling!” I answer through gritted teeth. I reply to her continuous wittering with a series of polite noises. She goes on. Eventually I cut her off, bored of her self-centred attitude. Me, me, me. “Lovely to speak, Ciao!” I jab at my screen to end the call. I have better things to do, who does she think she is calling me at this time of day? She knows perfectly well that my meticulous beauty regime takes up hours of my day. It takes time to look this good, after all! I deposit my phone into the drawer of my vanity table, distractions banished, and set about preening the already-perfect image that sits before me.